When selecting the feta to use in this pie, we compared the nutrition information panels of available brands and selected one that was lower in sodium (850mg per 100g). 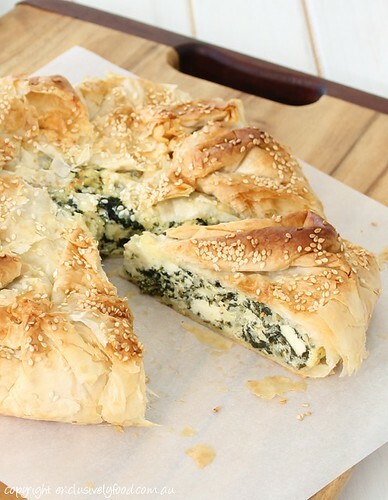 Using a feta that contained 1200mg sodium per 100g resulted in a pie that was too salty for our liking. We do not add any extra salt to the filling. Try to use a ricotta that is firm enough to be sliced into wedges, such as one sliced to order at a deli. A soft, spoonable ricotta can make the pie filling a bit too moist. You will need to work very quickly when buttering and layering the filo pastry as it rapidly dries out and becomes brittle when exposed to air. For accuracy, we use digital scales to weigh ingredients. We have included volume measurements in Australian Standard cups (250ml) and spoons (20ml tablespoon, 5ml teaspoon). Our large eggs have an average weight of 60 grams including shell. Preheat oven to 210 degrees Celsius (190 degrees Celsius fan-forced). Adjust the oven rack to the lowest shelf position; the base of the pie will brown and crisp better if close to the bottom element (not necessary if using a fan-forced oven). Grease a 23cm diameter (base measurement) round pie dish. If you use a loose based pan, it will be easier to remove the cooked pie. 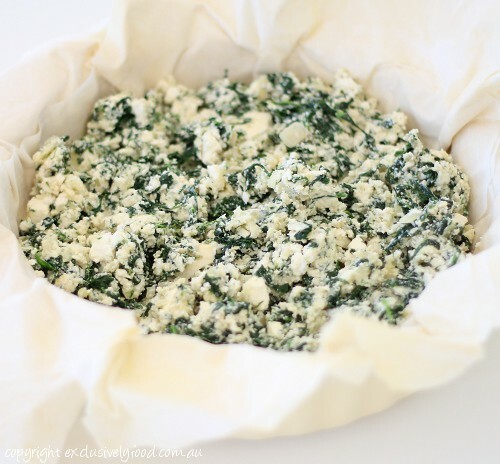 Wash the spinach and set aside until required. 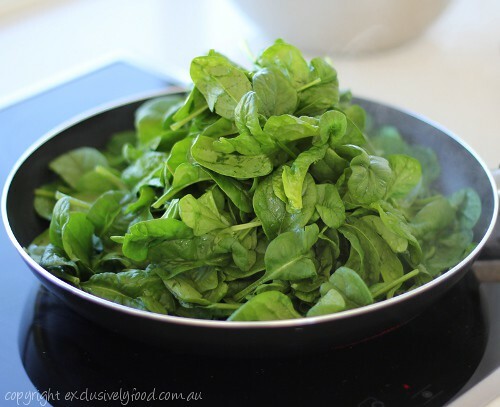 Don't dry the spinach because the water that clings to the leaves creates steam that helps when wilting the spinach. Heat the oil in a large non-stick frying pan over medium heat. 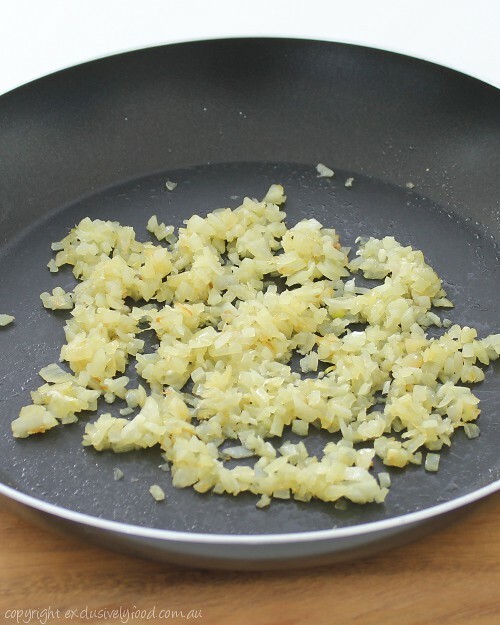 Add onion and cook, stirring often, for about five minutes, until softened. Add the garlic and cook, stirring constantly, for another minute. Transfer onion mixture to a large bowl and leave to cool. Return the pan to high heat and add the spinach. 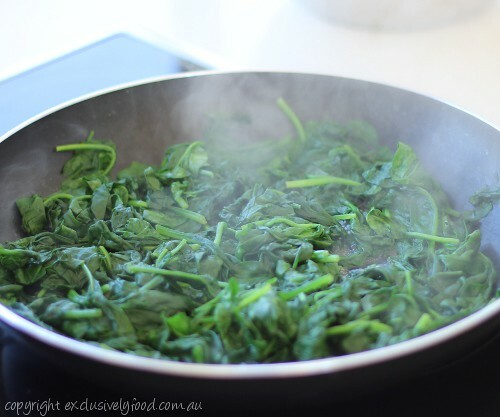 Use tongs to move the spinach around in the pan. When all the spinach has wilted down, transfer to a sieve/colander and set aside to cool. 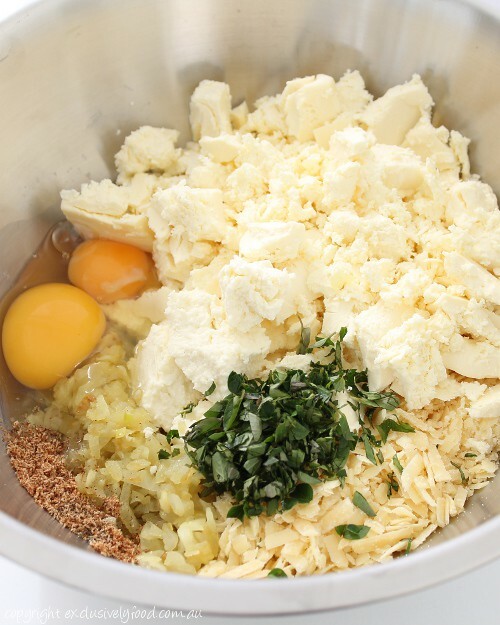 Add ricotta, parmesan, eggs, oregano, nutmeg and pepper to the bowl with the cooled onion mixture. Crumble in the feta. 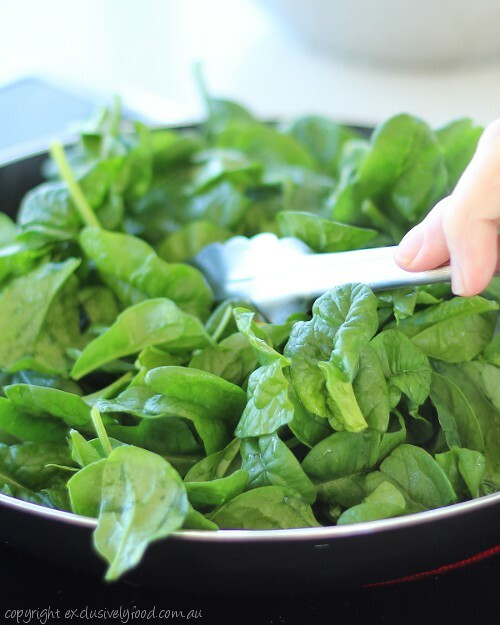 Remove excess liquid from the spinach by squeezing with your hands, or pressing against the side of the colander with the back of a spoon. 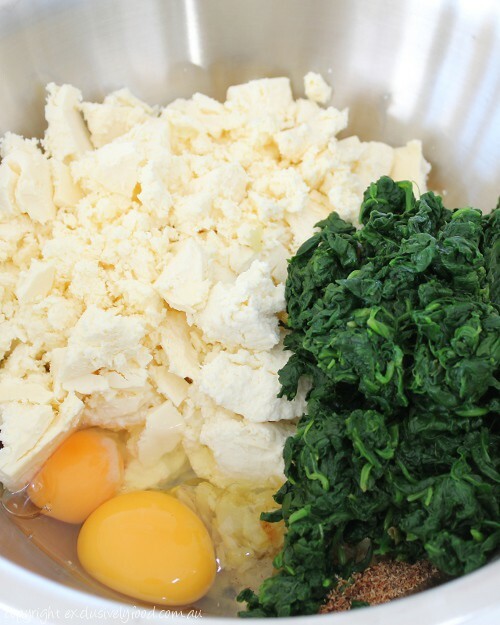 Roughly chop the spinach and add to the bowl with the other filling ingredients. Stir until the ingredients are well mixed. Set aside. Place the filo pastry sheets in a stack on a clean work surface. Cover pastry with plastic wrap or a clean tea towel, then a damp tea towel to help prevent the filo drying out while you are buttering and stacking the layers. Remove one sheet of filo from the stack and re-cover remaining sheets. Lay the sheet flat on a clean surface and lightly brush the pastry with melted butter. Top with another sheet of filo, placing at a slight angle to the previous sheet, and brush with more butter. Continue this layering process with remaining filo and butter, aiming to create a roughly circular pastry stack. 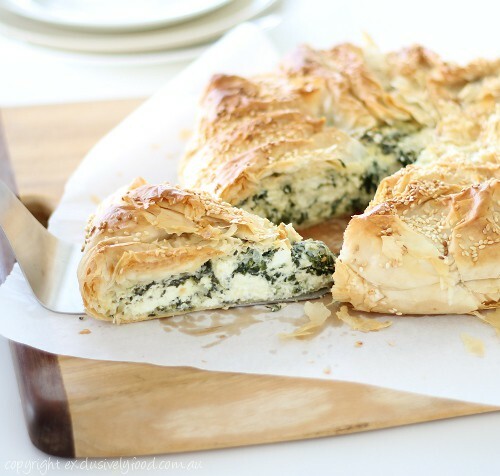 Line the dish with the filo stack, allowing the excess pastry to overhang the side of the dish. Pour the filling into the pastry case and spread evenly. Fold overhanging pastry over the filling leaving a small area in the centre uncovered to allow steam to escape during baking. 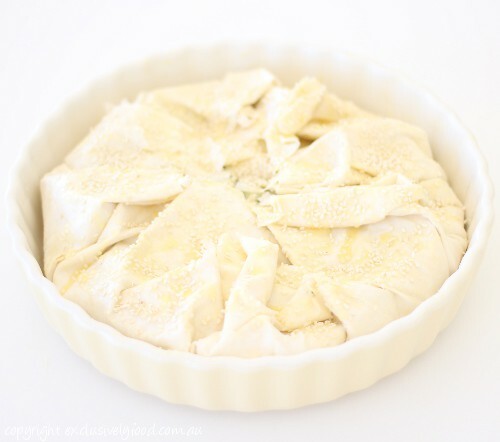 Brush top of pie with remaining butter and sprinkle with sesame seeds. If you are using a loose based pan, place the pan on a baking tray to catch any butter that leaks from the base. Bake pie for about 40-45 minutes, until the pastry is golden brown. Allow pie to stand for five minutes before slicing and serving. Yay - another recipe - will def make over the weekend. You both do a great job! Yay - I love recipes from here - looks like a sunny weekend picnic plan - thank you! 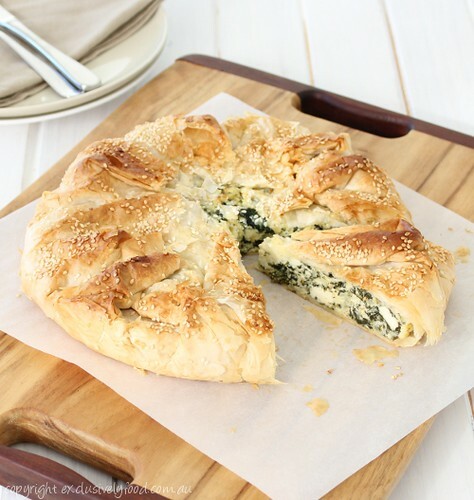 Goodness me, this looks incredibley tasty :) We'll be making this tonight, and I'm excited! :) Thanks for sharing! This just came out of the oven looks great. Used mint as that's all I had and had no sesame seeds...had a slice very tasty, much better than what you'd get in the deli. Fantastic!! Cooked it on Friday night and it was delicious. Hubby loved it even more than me and that is saying something for a carnivore!! I always prefer making pastry rather than using store bought, do you have a recipe that I could substitute? Could you use ricotta instead of Feta? It looks awesome and delish. I have to make this! Thanks. This is delicious and a winner with my 3 fussy kids. They all had thirds which is unheard of! 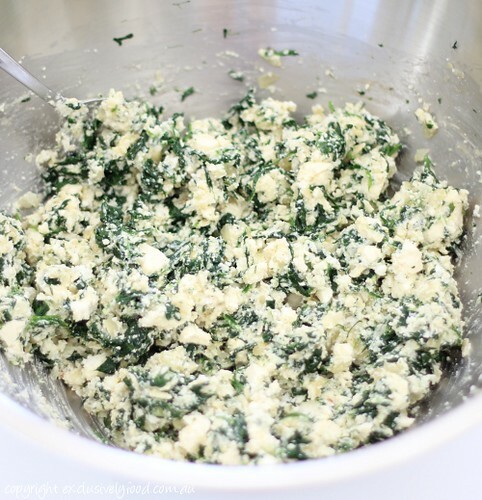 I used frozen spinach and less parmesan, as well as soft ricotta and it still turned out great.